The Frustrated Teacher: What's Wrong With Public Schools? Principals! This memo, from my principal a year ago, shows just how the process works for diagnosing and getting services (assessment; the other kind) for a student who may be in need. I have redacted (like the government) the principal's name and initials, as well as some other identifying material. 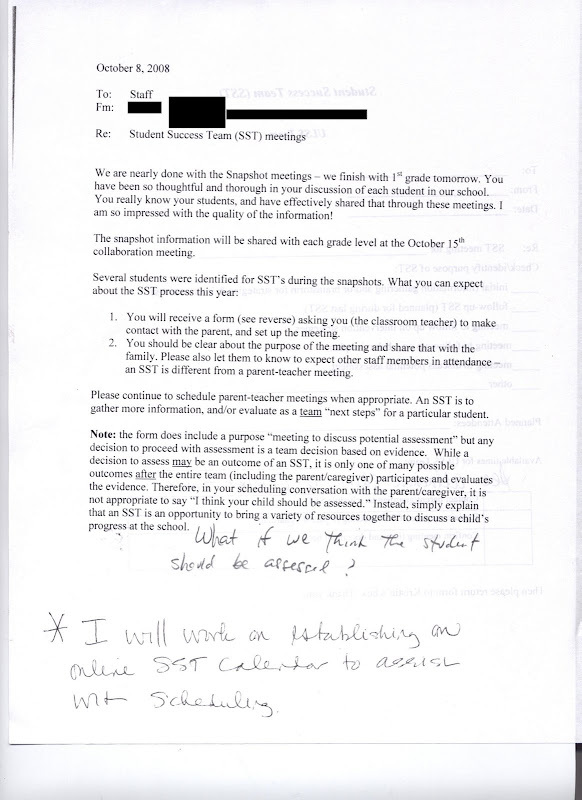 Note how the principal makes sure to include the instruction to teachers: "It is not appropriate to say, "I think...""
Well, I do think, so that's going to be a bit difficult, no? My hand-written question was merely rhetorical. No, she never established an online anything.